The PXV solenoid operated expansion valve controls the flow of refrigerant to the evaporator by modulating the opening time of the valve element, allowing a wide range of power variation. 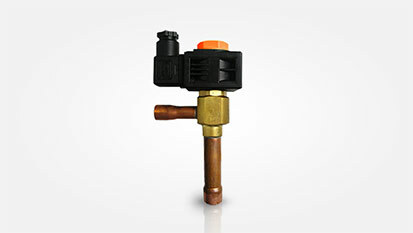 Highly precise and reliable control of refrigerant flow increases the efficiency of the entire system. There are 9 interchangeable orifices available, with power ratings from 1 kW to 24 kW. This valve must be piloted by a V800 or RTX/V electronic regulation device. The typical application is in refrigeration systems, especially refrigerated counter displays of the kind used in supermarkets.